Hotels/Camps Used:(A Class hotels with CTV, Cable Connection, Hot & Cold Water). Camba Camp in Nubra Valley. Uley Ethnic Resort in Sham (Near Alchi Monastery). 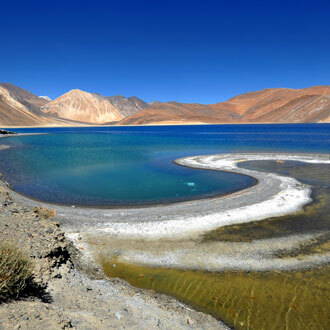 Camping in Tsomoriri & Tangsey (Near Pangong). Arrive Leh airport, received by our representative and transfer to Hotel. Check in to the hotel. Complete rest for the day after welcome tea and coffee by Hotel. Lunch at 2.00 PM after lunch, a walk around Leh town includes a visit to Leh Market, Leh Palace or Sankar monastery. Overnight in Hotel. After breakfast drive for full day sight seeing of Shey Palace, Thiksey, Hemis monastery and Stok Palace Museum. Lunch at Thiksey. Return Leh in the evening. Overnight in the hotel. 0800 Hrs. Drive for Khardungla Pass, World's highest motorable road at 18380 feet (39 Kms. Approx.) Return to Leh in the afternoon. After lunch rest of day at disposal to explore the local markets. Overnight at Hotel.